Stay at the Holiday Inn Helsinki City Centre hotel and you will find yourself in the middle of all the business, excitement and entertainment of Helsinki City. 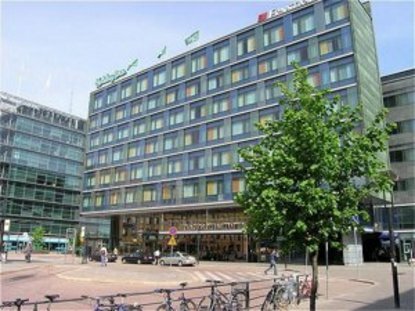 This modern hotel lies in the heart of Helsinki next to the main Railway Station joining modern and historical architecture together conveniently. Holiday Inn offers perfect facilities for business and leisure travellers. The hotel offers comfortable rooms, Staying with us you will be able to enjoy the good quality and core services of Holiday Inn. The hotel contains state-of-the-art rooms including comfortable amenities, high-speed internet access, Business Center and WIFI wireless internet hot-spot. For relaxing there is a Finnish Sauna and Minigym. For wining and dining you can choose Restaurant Verde. Stepping outside of the hotel, there is a large selection of sights, shops, restaurants, museums and places of interest just in the neighbourhood. Stockmann department store, Market Square, Kiasma and Ateneum Art Museum &reg just to name a few. If you are planning to visit other cities and regions nearby, you will find public transportation, local buses, trains and even metro in the immediate neighbourhood of the hotel. Or perhaps you would choose the tram to take you on a short sightseeing tour.Whether travelling on business or leisure, welcome to enjoy the Finnish hospitality at Holiday Inn Helsinki City Centre.